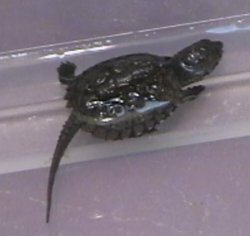 For information on caring for hatchling aquatic turtles, including snapping turtles, see my hatchling turtle page. 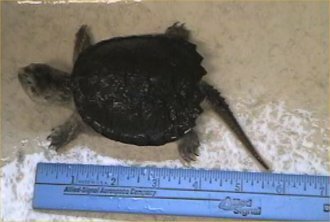 For more information about snapping turtles, see my snapping turtle page. I talk more about Snappy on my various hatchling turtle pages because he was the inspiration for my popular baby turtle web pages which in early 2006 I divided up from one page into/onto seven separate pages. 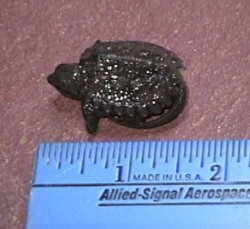 In late October of 2002, a relative brought me a turtle. She did not know what it was but had found it in a parking lot. Snappy was a baby snapping turtle in bad shape. It was already very cold outside so I decided to overwinter him and let him go in the spring. Through having read up on many animals before and trial and error, Snappy was well taken care of. The foods he ate, his setup, and more are mentioned throughout my various baby turtle pages now. Snappy was released on 5/23/03. Snappy - 10/20/02, in the water, about a week or two old, tail sticking out straight (the long tail is a dead giveaway that it is a snapping turtle). Snappy - 10/26/02, out of water by the ruler, tail tucked in. Snappy - close up of Snappy in his tank on 2/12/03. 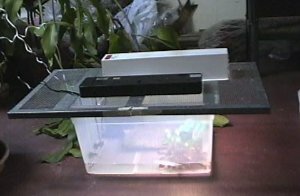 Snappy's cage - shows the cage from the side, showing the plastic storage box, lid, and lights, 2/12/03. 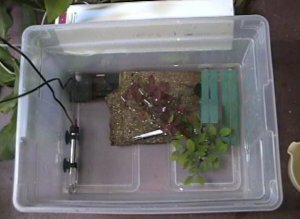 Snappy's cage from above - aerial view of Snappy's cage showing Duetto filter, heater, ramp, fake plants, and Snappy hiding. 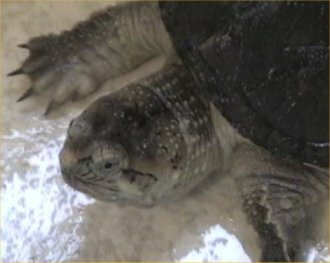 Snappy's head on the day of his release, 5/25/03. Notice the neat stripe behind his eyes, how small his eyes are, the fat folds on his legs since he was well fed, his sharp pointy claws, and the bumps on his neck. He was not a dull turtle! Snappy on the day of his release, 5/25/03. 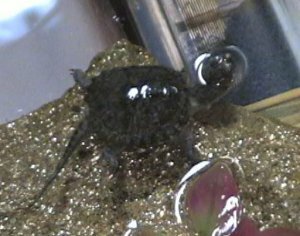 Notice the nice VVVV's along his back shell. His shell was about 3.5 inches long, his head was 1" except when stretched out to 2", his tail was about 3" sticking out, so Snappy was 7-8" total when stretched out all the way. Snappy was supposed to be released as soon as it was warm enough but here in Maryland, it rained all spring and into summer and stayed cool! After putting the release off due to rain and more rain, Snappy finally went to try out a new life on 5/25/03 in the pouring rain. I took two pictures before he left which you can see above (the last two listed). He was so beautiful to me! Snappy was 7-months-old and 7" long when released. 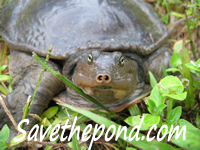 Snappers do best in moderate-sized ponds (10,000 gallons on up to a few dozen acres) with some deep areas but a lot of shallows, plants, insects, worms, and as they grow larger, fish and ducklings to eat. But, my mother insisted Snappy go into a humongous reservoir (a few hundred acres at least). It is mostly really deep (50-100' at least! ), cold, and sterile. We put him in a more shallow area with water up to a few feet deep. When I put him in, he sunk down a foot and started snapping at the leaves. I hope he can find earthworms and insects to eat! Then, after a short time, he needed to breathe so he tried to come up. Being used to water only a few inches deep, he struggled for a while with his pudgy feet (I fed him well) but finally came up. The water was colder (50 degrees F I am guessing) than the 75 degrees F I kept him at so he will have to get used to that. The odds are against Snappy, what with the cold water, deep water, having to work to find scarce food, predators (big snappers, herons, raccoons), and fishermen (they are not supposed to fish where he was but an empty earthworm container there indicated they did anyway!). His chances are slim to none but the time, money, space, and effort to keep him in captivity would have been as large as his appetite! And one day, he may have bitten off my finger! Plus, in the wild, Snappy can get a more varied diet and, if he lives, one day breed. Snappy was like any of my animals. I loved him and mourned him (I know, he may not be dead) so I wrote this poem for him. I know it does not rhyme nor does it follow the correct rules but I am no poet! When I got you Snappy, you wouldn't hurt a flea. I felt you were a he. you ate them through and through. Others thought you ugly but so they think of me. To me you were just my cute baby wee. and bit a hole in me. I hope you can live on and find a few bons bons (but don't eat too many duckies!). I never will forget you. and I love you a ton. Return to the main turtle page. See the master index for the turtle pages. Click below to vote for Robyn's Turtle Pages as a Top Turtle Site!